The first event of 2019 for Bellator takes place Saturday, Jan. 26, from The Forum in Inglewood, Calif. 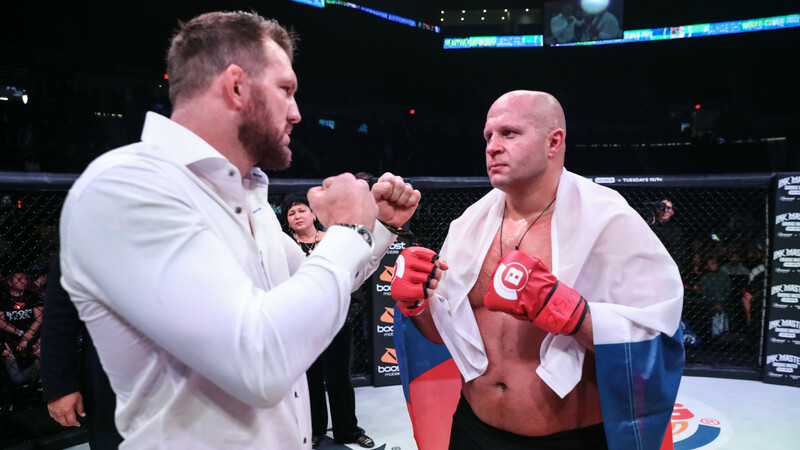 The main event will double as the finals of the heavyweight grand prix, with the winner becoming the Bellator heavyweight champion, and features a battle between Fedor Emelianenko and light heavyweight titleholder Ryan Bader. Emelianenko (38-5, one no contest), the former PRIDE heavyweight kingpin, made it to the finals by scoring vicious back-to-back TKO victories over Frank Mir and Chael Sonnen respectively. Emelianenko comes in having won seven of his last eight contests. Bader (26-5) made it to this point by winning six consecutive fights, including 11 of his last 12. The 35-year-old knocked out Muhammad Lawal in 15 seconds in May followed by a mauling of Matt Mitrione at Bellator 207 to advance to the finals. Can Bader make history and hold two titles simultaneously, or does Emelianenko have one more run in him to be first fighter in MMA history to capture PRIDE and Bellator gold? Bellator 214 takes place on Saturday, Jan. 26. The prelims start at 7 p.m. ET, and main card coverage begins at 9 p.m. Emelianenko and Bader are expected to enter the octagon around 11:30 p.m.
How do I watch Bellator 214? You can watch Bellator 214 on the Paramount Network. If you don’t have a cable or a satellite provider, Bellator 214 is available on DAZN. Fans in North America can take advantage of a 30-day free trial to watch the fight online with DAZN, the global live-sports streaming service that agreed to a multi-year deal with the promotion in June. • How much does DAZN’s live sports streaming service cost? Bellator 214 takes place at The Forum in Inglewood, Calif. According to Bovada (as of Jan. 21), Bader is a -360 favorite, while Emelianenko is a +270 underdog.